Vibhor Sogani, born in Jaipur, India specialised in Industrial Design from the prestigious National Institute of Design, Ahmedabad, India. Vibhor’s style is experimental and language transformative. His passion in exploring diverse materials like steel, brass, copper, bronze, stone and mixed media, coupled with a strong interest in fine art has led to innovative artistic expressions. Vibhor’s language is modern, and has that international cosmopolitan flavour which is a natural corollary to the material he is dominantly using – steel. 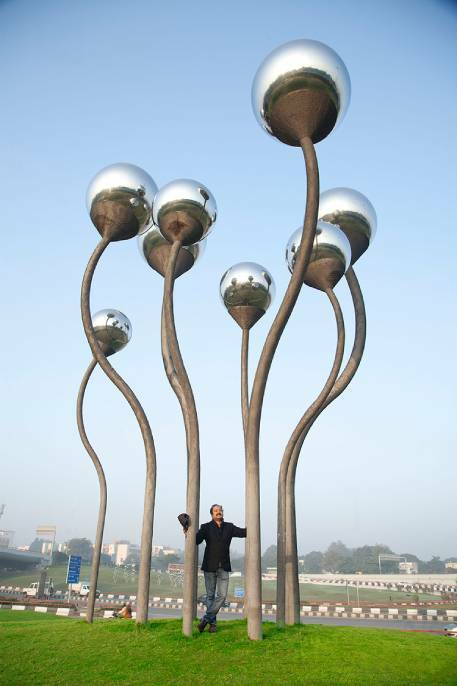 One of his prominent works is the largest public art installation of India – The Sprouts. The 40 feet high creation in steel is installed in the 6 acres of greens which lies between the flyovers at AIIMS crossing, in the heart of New Delhi. It was a Government initiative towards beautification of the capital. Today it is considered a prominent landmark of the city. He has also executed a 30 feet high public art installation titled ‘Kalpavriksha – the wish fulfilling tree‘ located on a 100ft. roundabout at Arvind Group’s Uplands, Ahmedabad. Over the years Vibhor’s work has been exhibited in various design and art shows in India and overseas like Australia, Zimbabwe, Tanzania, South Africa, Singapore, Germany etc. His exhibitions have often been supported by the Indian Government and the Governments abroad. Recipient of many honours, Vibhor has also been awarded ‘Indian Art Icon of the Year 2014′ in Singapore. In 2017, Vibhor was nominated by the Government as a member of governing body of the India Design Council.